Modern reverse-osmosis desalination plants, such as those planned or proposed on the California coast, take in large volumes of seawater – generally two gallons are withdrawn for every gallon of freshwater produced – and pass it through fine-pored membranes to separate freshwater from salt. The highly concentrated brine is then typically disposed of back into the ocean. With the majority of desalination plants extracting water directly through open water intakes in the ocean, there is a direct impact on marine life. Fish and other marine organisms are killed on the intake screens (impingement); organisms small enough to pass through, such as plankton, fish eggs, and larvae, are killed during processing of the salt water (entrainment). The impacts on the marine environment, even for a single desalination plant, may be subject to daily, seasonal, annual, and even decadal variation, and are likely to be species- and site-specific. These impacts, however, are not well understood. More research is needed, especially to understand the long-term impacts. We do, however, know that there are several operational, design, and technological measures available to reduce the marine impacts of open water intakes. In particular, subsurface intakes can virtually eliminate impingement and entrainment, as they extract seawater from beneath the seafloor or a beach. The sand acts as a natural filter, providing a level of pre-filtration that can reduce plant chemical and energy use and long-term operating costs. “Subsurface intakes are being used in a growing number of plants around the world, as new drilling technologies – like the directional drilling that has made hydraulic fracturing possible – have made subsurface intakes possible in more locations. Now, even where the site is surrounded by generally unfavorable conditions, it may be possible to find a pocket with the right ones,” said Heather Cooley, co-director of the Pacific Institute Water Program. Another major environmental challenge of desalination is the disposal of the highly concentrated salt brine that contains other chemicals used throughout the process. Because all large coastal seawater desalination plants discharge brine into oceans and estuaries, including all of the proposed plants in California, steps must be taken to ensure its safe disposal; at this stage, we know very little about the long-term impacts of brine disposal on the marine environment. Twice as saline as the ocean, the brine is denser than the waters into which it is discharged and tends to sink and slowly spread along the ocean floor, where there is typically little wave energy to mix it. There are several proven methods to disperse concentrated brine, such as multi-port diffusers placed on the discharge pipe to promote mixing. Brine can also be diluted with effluent from a wastewater treatment plant or with cooling water from a power plant or other industrial user, although these approaches have their own drawbacks that must be addressed. The Key Issues for Seawater Desalination series is an update to the 2006 Pacific Institute report Desalination with a Grain of Salt, which has proven to be an important tool used by policy makers, regulatory agencies, local communities, and environmental groups to raise and address problems with specific proposals. Researchers conducted some 25 one-on-one interviews with industry experts, environmental and community groups, and staff of water agencies and regulatory agencies to identify key outstanding issues for seawater desalination projects in California. 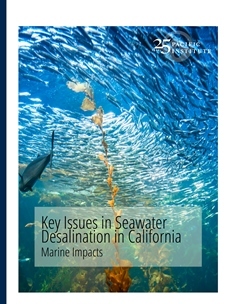 The resulting reports address proposed desalination plants in California, costs and financing, energy and greenhouse gas emissions, and marine impacts.